All things eye | Por Yong Ming: How is glaucoma treated? Hence, the main aim of treatment in glaucoma is to lower the eye pressure. Sometimes, the eye pressure may be in the ‘normal’ range of 10-21mmHg, but the nerve continues to deteriorate. In such cases, the eye pressure is lowered further still. 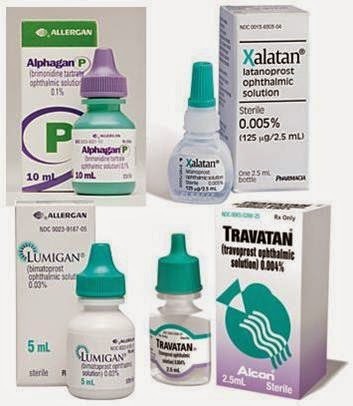 Lowering the eye pressure of most glaucoma patients starts with eyedrops (right). Fortunately there are many medicines available now to reduce eye pressures. If using one does not lower the pressure enough, the doctor may change the eyedrop to a different one, or a second eyedrop may be added. In patients with very high pressures, an oral medicine called Diamox may also be used. Medicines used to lower the eye pressure either reduce the production of fluid inside the eyeball, or they help the fluid to drain out of the eye more easily. Medicines that do the former include beta blockers such as Timolol, Brimonidine (Alphagan), and Dorzolamide (Trusopt). Others that help with drainage include the prostaglandin analogues Latanoprost (Xalatan), Travaprost (Travatan) and Bimatoprost (Lumigan). In most cases of glaucoma, long term use of the medication is required. When the medication is stopped, the pressure starts to rise again, and optic nerve damage gets worse with enlargement of blind spots. It is very important therefore, that glaucoma patients do not stop using their eyedrop unless their doctor says it is OK to do so. As with any medication, glaucoma medicines may have side effects. The most interesting concern the prostaglandin analogues. They do not cause any serious life or sight threatening side effects, but often make the eye redder than normal. This effect can persist for some months, and then often gets better by itself. They also make the eyelashes longer, an effect which has been exploited in the eyelash lengthening treatment called Latisse. Another cosmetic side effect that is often undesirable is the changing of the iris colour, usually from a lighter blue or green colour to a browner colour, as seen below. In cases of glaucoma where the front of the eye is narrow, a laser procedure called a laser peripheral iridotomy may be performed (See figure below-the two black dots are small holes in the iris made by a laser; the video below shows the procedure being performed with an Nd:YAG laser). This is a simple procedure performed in the clinic and may take 15 minutes to complete. It helps to improve fluid flow out of the eye despite the narrowness of the anterior chamber. In some patients, medical or laser treatment fails to lower the eye pressure, necessitating surgery. In the most common operation, a new channel is created for fluid to drain out of the eyeball. This operation is called a ‘trabeculectomy’. To facilitate drainage, sometimes a metal tube (called the ExPRESS shunt) is used as well. In some patients where trabeculectomies have previously been performed but eye pressures have increased again, silicone drainage tubes may be implanted for better fluid flow out of the eye and pressure control. Many people with glaucoma are worried about blindness. However, most glaucoma patients do not become blind. The most important factor is control of the eye pressure, which is achieved either with the use of eyedrops or surgery. If eyedrops are regularly instilled, and eye pressures are well controlled, vision is usually well preserved. However, patients should realise that damage to the nerve before treatment was started cannot be reversed. The aim in glaucoma treatment is to stabilise the condition, and in most patients vision is maintained for life. Thanks for reading, Christina! Yes, although the effect can be somewhat minimised by making sure the medicine doesn't get onto the skin, and we now also have the lower concentration Lumigan (0.01% instead of 0.03%). This is supposed to be just as effective at lowering eye pressure, but with the advantage of causing less redness and maybe pigmentation. hi dr por, how did u know it's me from the blogger name？yes, less is always better in reducing side-effects. if all else fails, there're always lasers and ipl to blast off the pigmentation if it poses a problem! can't help the iris though. Uncommon surnames (like mine), or spellings of surnames, are noticed more easily I guess:)! if eyedrops (medicine) no longer effective in controlling the eye pressure, what is the recommended action to take? If eyedrops are not effective in controlling the eye pressure, the usual next step is eye surgery. The conventional operation is called trabeculectomy, which has been used for many years. During this operation, the doctor creates a new channel for the fluid to drain out of the eye, thereby lowering the eye pressure If the pressure is low enough, sometimes the patient may not even need to use eye drops. However, as with any surgery, there are potential risks, and therefore if eyedrops can lower the eye pressure enough, these are recommended before surgery is done. Buy careprost online cheap and have best eye care product for glaucoma disorder.